Relax, unwind and discover the fantastic range of art and design on show in the friendly surroundings of the Shipley. Over the last 25 years the venue has become established as a national centre for contemporary craft and has built up one of the best collections outside London, including ceramics, wood, metal, glass, textiles and furniture. The Gallery has recently undergone a 650,000 redevelopment and March 2008 saw the opening of the new Designs for Life gallery. This permanent gallery is home to hundreds of objects made in many parts of the world over the past 2000 years. These objects range from the special and unique to the everyday and mass-produced. They take us on a journey to explore the huge variety of ways in which we use the material world to express ourselves and to enrich our lives. The Shipley also boasts a spectacular collection of fine art, including William Irving's painting The Blaydon Races. The Gallery stages a varied programme of temporary exhibitions as well as regular events and activities for all ages. 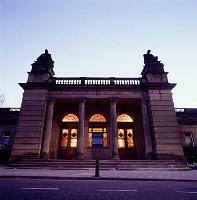 The Shipley Art Gallery is just off the main A167 road into Newcastle with ample free on-street parking. The gallery is accessible by public transport from Gateshead Metro and bus station.